Graphics: Sandeep Bhatnagar / Mint. Mumbai: Qualified institutional placements (QIPs) have emerged as the favoured instrument for raising equity capital, outstripping initial public offerings (IPOs), follow-on public offerings (FPOs) and rights issues, effectively shutting out retail investors. The convenience of a QIP, introduced three years ago, has meant a drying up of follow-on public offers (FPO) by listed companies. In fact, only one company, Rishabhdev Technocable Ltd, has filed an FPO, for Rs22 crore, this year. So far this year, at least Rs17,454 crore has been raised through 24 QIPs, against Rs9,678 crore through eight IPOs. A QIP is a private placement of stock or securities convertible to equity by a listed company with qualified institutional buyers approved by the Securities and Exchange Board of India (Sebi), the market regulator. “QIPs have a lot of advantages and this year corporates may end up raising more money through these placements than IPOs and FPOs," said S. Subramanian, head of investment banking at Enam Securities Pvt. Ltd. “Public offers take a longer time frame (and) involve preparing these young companies and bringing them to market." The trend, he predicted, will only get stronger over the next few years. “Now, we have a lot of young companies (for IPOs) but as the market matures, we will see more money being raised from secondary issues from existing companies," he said. The QIP pipeline is more impressive than that of prospective IPOs. At least 43 companies have received board or shareholder approval to raise at least Rs49,949 crore, according to data from Delhi-based SMC Capitals Ltd. Seven more, which have also received similar approvals, have not disclosed the amount they want to raise. The approvals are valid for a year and companies can raise the amount approved in more than one instalment. According to Sebi website, only 17 companies have filed draft offer documents for their IPOs in 2009, against 69 companies for all of 2008 and 130 in 2007. 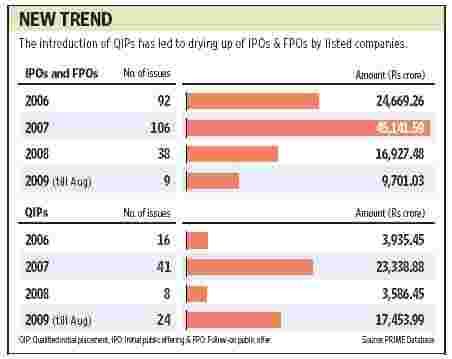 The IPO line-up looks sparse until at least Diwali (in mid-October). “There are no new IPOs in the pipeline after Pipavav Shipyard (on 16 September). No issues will hit until after the Diwali holidays. Whatever we are doing now are the ones that had got Sebi clearances last year," said Atul Mehra of JM Financial. Jagannadham Thunuguntla of SMC Capitals said even companies that had plans to raise money by hiving off businesses and taking them public might now do a rethink and look at QIPs instead. One example of this, he said, was Future Ventures India Ltd, a Kishore Biyani-promoted company that has not reapplied for its IPO after its Sebi approval lapsed in December. Reliance Infratel Ltd IPO approval has also lapsed. The Business Standard reported earlier this month that the company will file a fresh draft red herring prospectus with Sebi to raise Rs5,000 crore through an IPO. The company declined to comment for that report. Reliance Infratel and Future Ventures are among at least 40 companies that have allowed their Sebi IPO approvals to lapse. However, Ravi Kapoor, managing director, Citigroup Global Markets India Pvt. Ltd, said more companies will get approvals given that growth capital is now available and that approvals take two-three months to clear. Kapoor said the QIP pipeline should not be taken at face value. “As far as the pipeline for QIPs is concerned, you need to calibrate the number a bit as people typically get approval for a higher amount though they might raise only a fraction of it." Where QIPs score over IPOs for institutional investors is the definite track record on which to base a decision. Also, price discovery in an IPO becomes risky in volatile markets. Already, the recent issues of Adani Power Ltd and NHPC Ltd have dipped below their issue price. This QIP attraction is also shrinking overall IPO sizes. Haldea said. “Companies tend to sell a small stake during IPOs and raise further capital through QIPs later. That’s because QIPs get much better valuation and in IPOs, everybody tends to underprice," he said. But there are pricing limitations on QIPs too, said Indraneil Borkakoty, associate director and head equity capital markets, Kotak Mahindra Capital Co. Ltd. Still, due to the nature of the pricing rules, QIPs tend to be the preferred route when the market is slacking, he said. “Typically, if the market is peaking, it is better for IPOs as they have some leeway to price at a discount. But… for QIPs, there is a definite floor price where the price cannot be below the two-week average. That could limit your flexibility in terms of pricing," he said.